The Board of Directors and the chamber team are excited to announce its Annual Dinner for Saturday, January 19th, 2019 at Keuka College. 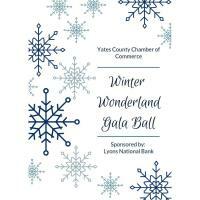 Please join the Yates County Chamber of Commerce for their annual Dinner Dance fundraiser. In addition to our traditional Silent Auction we will be hosting a Live Auction by local Auctioneer Jere Horning. We will also be offering a Wine Pull, which will allow you to go home with a local bottle of wine from around the Finger Lakes. We are happy to announce that we are able to accept credit cards payments for registration as well as the night of the event for auction items. Register today for this great event, by clicking here. Sponsorship Opportunities and Table Options available, by clicking here. Contact the Chamber today, 315-536.3111, if you are interested in sponsoring or you are able to register for sponsorships at the above Regstration link.